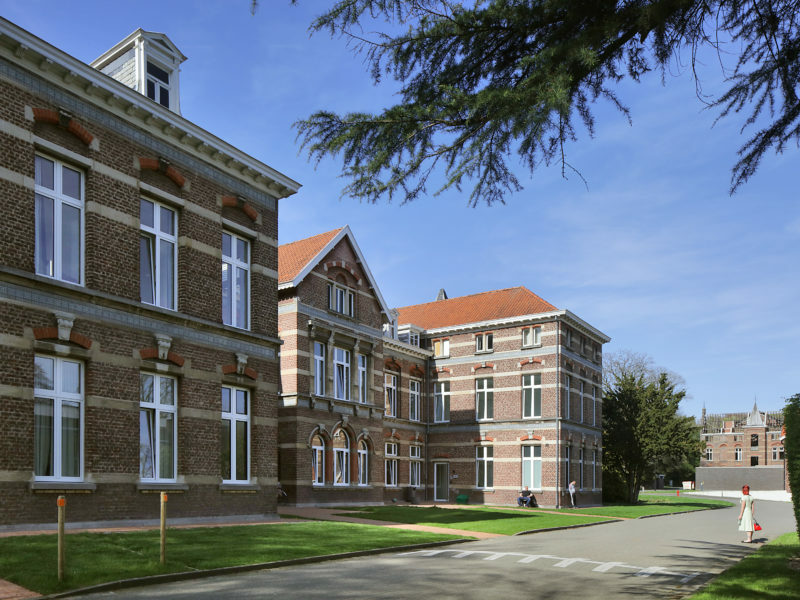 The Kanunnik Petrus Jozef Triest Square is an open structure in the heart of the Caritas Psychiatric Centre in Melle (near Ghent, Belgium). It is an unexpected outcome in the margin of the development of a vision for a spatial masterplan for the psychiatric centre. Inspired by Doina Petrescu’s ideas on the user-architect, all the users were brought together at the drawing board. Workgroups of psychiatrists, managers, staff and patients examined the question of how the psychiatric centre in the future should look like. In this text I open the files of the practice-based research conducted at the Caritas Psychiatric Centre. The newly opened Kanunnik Petrus Jozef Triest Square is the starting point to reflect on 1) the possibilities to common the (psychiatric) clinic, 2) the construction of design intelligence on care architecture, and 3) the dialectics of process and object in the dissemination of architectural knowledge. Summer 2014 we were asked by the Caritas Psychiatric Centre in Melle (near Ghent, Belgium) to define a spatial masterplan on the occasion of a massive demolition program for pavilions built in 1908 and the future building program of a new crisis unit and a children and youth psychiatric unit. The request was a miscast somehow. Clearly the director and the principal psychiatrist were inspired by case studies on care architecture I had been publishing over the years in Psyche, a quarterly magazine published by the Flemish Association for Mental Health (VVGG). No doubt a design practice is something else. ‘Tell me, what is care architecture?’ asked the director in our first walk through the small universe of the psychiatric centre – referring to the header of series of articles. Unease was even bigger after my hesitation to provide a ready-made answer to the directors’ ominous question. Enthusiasm was restored after a provocative proposal to elaborate the masterplan through an interactive process involving everybody. The rationale being that the definition of care architecture should take into account local specifics and should be done in close engagement with local actors. The proposal was motivated by a theory course on the commons taught together with Lieven De Cauter at the KU Leuven Faculty of Architecture in which we attempted to bridge philosophical works on the topic with architectural practice today. In particular the hybrid work of Doina Petrescu and Constantin Petcou (Atelier d’Architecture Autogérée) provided the conceptual tools to envision how the commons lead to other ways of doing architecture. The master thesis project of Fie Vandamme (2014) in Leuven Central Prison, in which I participated as promotor, was used as a proof that it makes sense to engage users, in this case a group of long-term detainees, in deepening an architectural debate. And so it happened that different workgroups of psychiatrists, managers, staff and patients were brought together at the drawing board to envision a spatial masterplan and find an answer to the question of care architecture. Interestingly the course of events took an unexpected turn not only dreaming up the psychiatric centre of the future, but also directly intervening in the ongoing building process. While at first the demolition of a Century old heritage was accepted as given framework for the vision development, it became clear to all participants that staying true to the new vision implied a redefinition of the very framework itself. Halting the demolition process and redeveloping the ruin-like Saint-Josef pavilion into an monumental outdoor structure started to function as a pars pro toto for the psychiatric centre of the future. The ‘Kanunnik Petrus Jozef Triest Square’ – as the monumental outdoor structure was renamed in reference to the founder of the hospital – became the laboratory for the psychiatric centre of the future, both sketching the contours of the future and allowing to test-drive the future here and now. The sudden creative idea to save the Saint Josef building triggered a chain of consequences at administrative level: finding support at the Board of Directors, renegotiating the contract with the demolition firm, redirecting budgets, dropping the life-long blanket contract with the architect, etc. The presentation of the draft masterplan to the full staff was scheduled at the new year reception (January 25, 2015). In the weeks leading up to the presentation, the idea to save the Saint Josef building gained sudden attention after a sketch was brought to the Board of Directors (January 5). The idea was further worked through in adhoc workshops with elderly patients in day treatment and patients in the treatment program for Young Adults. In the following months the conversion of the Saint Josef building took over the process. The invited tendering to architects was finished June 2015. It took another year until the Kanunnik Petrus Jozef Triest Square was opened in June 2016. 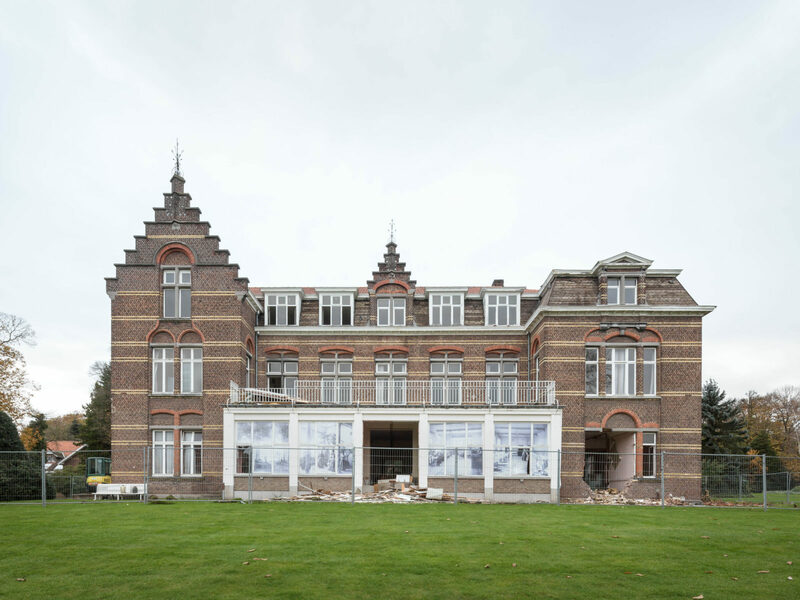 Chapter 1) discusses how the resocialisation of the psychiatric centre demands a reconceptualization of the current hospital architecture and another design practice. Chapter 2) discusses the contribution of the workgroups of psychiatrists, directors, staff, and patients in formulating a new design intelligence on care architecture. Chapter 3) discusses how the new design intelligence was activated and embedded in the daily functioning of the psychiatric centre. Making architecture a subject of common deliberation is unusual in the institutional context of mental health care. The design of hospitals is a technical affair dealt with by the facility management. Moreover, lifelong blanket contracts make that the architect is the subject-supposed-to-know everything about the hospital qua infrastructure. Input by the staff is limited to the definition of the requirements – assisted by patients in the role of so-called ‘experts by experience’. Theories on the commons provided us with a line of flight to introduce the user – patient as well as staff – onto the playing field formerly reserved for the architect alone. A good starting point are the three elements that Massimo De Angelis uses to unfold the concept of the commons. In the first place, it is most important that the psychiatric centre is in the words of De Angelis “[…] some sort of common pool of resources, understood as non-commodified means of fulfilling peoples needs” (Anarchitektur, 2010). In our case, the hospital is certainly a private domain – property of the Sisters of Mercy congregation – and functioning with public budgets – involving both federal Health Care and regional Welfare. At the same time the famous Article 107 of the Hospital Act (Ziekenhuiswet, 2008) has changed the mental reality of former asylums re- conceptualizing it as part of so-called ‘care circuits and networks’. Today mental health care programs make use of the social services in villages nearby and the other way around: the psychiatric centre presents itself as an extension of these social services – for example by opening up the sports infrastructure to local organizations. Also the care circuits hook into the private home and family life of patients using mobile teams, day treatment programs and drop-in houses. This institutional wave change in the field of psychiatry provided the excellent backdrop to deconstruct the architectural and spatial setting and deal with it as a commons. The community is the second element of the commons. “Communities are sets of commoners who share […] resources and who define for themselves the rules according to which they are accessed and used,” writes De Angelis (Anarchitektur, 2010). Of course, the institutional context poses practical problems, such as creating free time in staff schedules. A bigger obstacle we faced was the ethical question whether patients can be enquired about the therapeutic setting without disturbing the individual treatment. An answer was found by changing the subject position. In the workshops the patient is not considered as the needy person in search for help, but someone that is, based on everyday spatial experiences, very well capable to provide design suggestions. The heterogeneity of the user group was a second objection. The psychiatric centre is an impossible community with conflicting interests – in the first place between patients and staff. The first deals with the psychiatric centre as a care environment, the second as a work environment; the first is – at best – a sojourner, the second has a long-term contract; the first is in residence night and day, the second working in shifts, etc. This issue diluted along the way as it became clear that patients and staff often share similar spatial experiences – most notably the feelings of estrangement in what was called the ‘empty sea of green’ (Boie and Vandamme, 2015a). The third element concerns is, again quoting De Angelis, “the verb ‘to common’ – the social process that creates and reproduces the commons” (Anarchitektur, 2010). A series of workgroups was set up dealing with several combined treatment programs: 1) Anxiety and Mood Disorders, 2) Gerontopsychiatry, Non-congenital Brain Defects and Mental Handicap, 3) Rehabilitation and Day Treatment, 4) Children and Youth Psychiatry and 5) Psychosis Treatment. The workgroups formulated in common deliberation the needs and desires both in words and images. Ten or more transversal concepts were used to crosslink the loose ends in a more or less coherent spatial program. The workgroup results were discussed in a parallel trajectory of masterplan committee including members of the Board, management, psychiatrists and the architect. Having the workgroups behind us, we found the masterplan committee being not so much a filter as well as a possibility to ratify the common proposals. Final result was a set of spatial structure plans concerning heritage, green spaces, mobility, places for activity, places to rest, etc. To put the three elements in motion, however, it was necessary to build something I would define as the ‘atmosphere’ of communing – using a term coined by Susanne Hofmann (2014) to stress that importance of the corporeal experience for user engagement in her practice with Die Baupiloten. For that purpose we looked for a meeting place outside the board rooms. Our dream to create a pop-up workshop in the empty Saint-Josef building was said to be impossible as the demolition works could start any day. In the end a left-over room at the entrance of the hospital restaurant was perfect décor to discuss fundamental issues in a low pressure atmosphere. The meeting culture in the psychiatric centre was turned upside down by moving tables and chairs aside, using walls and floors to exhibit materials, distributing snacks and fruits, etc. The result was, using the words of Hofmann (2014): “The drawings, collages, collections of adjectives, photo panels, or atmospheric models that arise from these workshops create an […] atmosphere which makes communication and understanding between architect and user more fluid.” Apart from that, holding onto the joyful atmosphere is paramount – as atmosphere will easily collapse the moment people feel that input is not taken serious in the following design process. It was therefore that we reported incessantly on all discussion topics and provisional outcomes. Equally important were the extra feedback loops stemming from spontaneous actions by staff organizing patient enquiries, walks and photography sessions. Finally informal feedback was acquired from casual chats while loitering around the campus. The workgroups of psychiatrists, management, staff and patients functioned as a vehicle for the formation of a new ‘design intelligence’ on care architecture (Speaks, 2010). Strikingly most participants experienced architecture in terms of what Charles Jencks (2012) called ‘negative architecture’ – a factor that put constrains on everyday acts and limits our imagination – for reasons easy to understand. A lot of buildings in the psychiatric centre are not designed for the specific function it houses today. Internal moving of entire treatment programs are frequent and it makes that staff have to fit their visions and values within ready-made buildings. Another problem is what we could call the ‘relative inertia of space’. “Everything is clear enough in absolute space and time, but things get a bit more awkward when it comes to relative space-time and downright difficult in a relational world,” wrote David Harvey (2004). The design of new buildings often look hopelessly outdated the moment it is finally put to work. Development of visions and values have a totally different pace. And, accelerations in the building process lead to a zero degree in architecture – as we see in the temporary container constructions. The visions fostered by psychiatrists, management, staff and patients equally collided with the pre-existing design knowledge available in the psychiatric centre. Taking a look at the recent buildings on the Caritas site – erected short before and after the year 2000 – show shameless repetitions of blueprints. Custom typologies and elements in hospital architecture are easily copy-pasted – often disregarding differences between somatic care and mental health care. We see a mess of endless corridors with mirroring rooms and dysfunctional sitting areas knitted together by nursing posts. We see heroic forms that keep up the appearance of a welcoming holiday resort in a remote green environment. Michael Speaks (2010) defined these two elements specifically – fixed typologies and heroic forms – as the obstacles of a new design intelligence. And making it even worse: the generic architecture is in sharp contrast with the hyper-specific characteristics of the treatments for all sorts of psychiatric profiles. Architecture was experienced as an infrastructure – or better called an ‘infra-architecture’ (De Cauter and Dehaene, 2007) – that is not so much an invisible and neutral support but is on the contrary an omnipresent medium that colors the content during the operation. 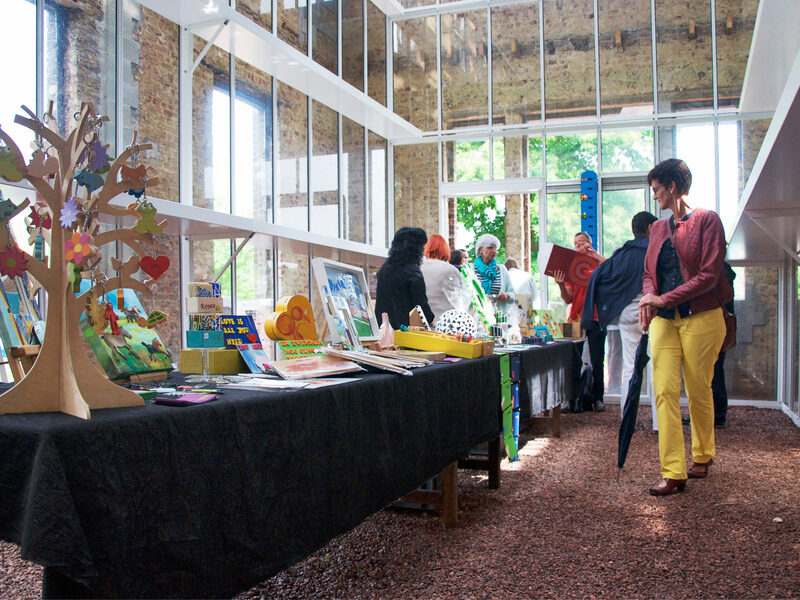 Fighting this situation, the workshops created a space in which the users could express their real needs and desires. Against the capacity of stereotypes to absorb creativity, Michael Speaks (2010) defended that it is only from ‘chatter’ and even ‘bullshitting’ that design intelligence is born. The talks in de workshops were certainly a sort of bullshitting in so far as it is meaningless within the usual architectural reference frame and also irrelevant in the usual decision processes. I prefer to talk about ‘professional bullshitting’ or ‘dead serious bullshitting’. The needs and desires expressing another kind of architecture imaginary were not just some hollow phantasies but are motivated by visions and values people hold dear, and are inspired by spatial experiences in specific situations. These are not ready-made typologies and elements, but real life fragments that were discussed in mutual respect and carefully reflected upon from all sides. Charles Jencks (2012) wrote: “architectural determinism works in some conditions, but only to a degree, and it depends on the culture of the inhabitants and their other conditions of stress and well-being.” It was by installing another design culture that we turned this omnipresent view of ‘negative architecture’ into something the director defined as ‘space of potentialities’. 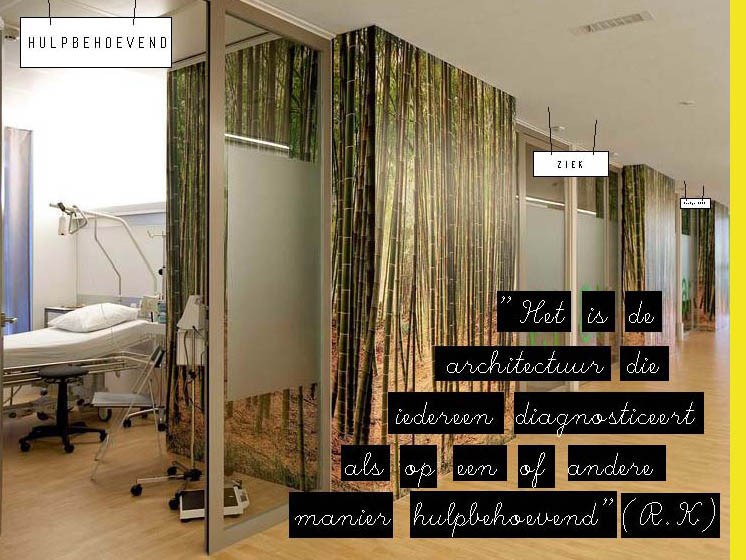 Doing so, it became possible to rethink the hospital as – using a term introduced by Marcel Smets (2006) in his former function of Flemish Government Architect – an ‘integrated architecture project’ that merges with both the vision on care fostered in the local facility and the everyday services provided there. The design of hospitals is – as with other institutional building programs – usually wrapped in a linear process. First the requirements are defined and subsequently the architect is asked to invent an appropriate architecture. In the workshops a dialectical process was evolving, allowing the staff and patients to talk about architecture directly. Thinking in terms of space allowed them to reflect upon unresolved paradoxes of mental health care and in turn the visions and values were immediately tested taking into account the necessary spatial requirements (Roose, 2016). Finally, bringing a heterogeneous group of users together made it also possible to think architecture in terms of ‘scenarios’ (Oosterling, 2013). Blueprints, typologies and structural elements are useful only when we stick to autonomous functions in the psychiatric centre – residential area, hospital school, control, therapy, etc. Having talks with users all having different responsibilities, competences and capabilities and all being active in different treatment programs, the workgroups started to define the interval spaces connecting the one or the other function. A question that received a lot of attention was for example what was called the ‘in-between zone’ – the transition from inside to outside, the distance from the residential area and the restaurant, the arrival or departure at the psychiatric centre, etc. Other questions were the navigation or wayfinding throughout the labyrinth of corridors and doors, the difficult match of surveillance and presence, etc. The scenario does not concerns one element but defines the relation between one, two or more spaces and equally includes conflicting functions at the same time. In qualifying participation processes it is tempting to take the organization form as yardstick – being either horizontal or vertical. From a democratic perspective the initiative of inhabitant committees and action groups are favored above the initiative of government agencies and institutions (Petrescu, 2005). The authentic character of participation is, however, more likely linked with the possibilities for dissemination of results. Peter Verhaeghe(2017), architect-activist involved in the successful protest against the Oosterweel Highway Link in Antwerp, stated that a government is legally forced to launch a public hearing, but not forced to read the complaints and suggestions by citizens. Doing so a massive energy and possible knowledge is drained away in a bureaucratic procedure. But compulsive participation is not reserved for government action alone. Also genuine horizontal participation processes can get caught in turning circles. There are enough horizontal cases to find that ended up in endless deliberations and actors became blind for eventual anchoring point to translate their insights into a living practice. Dissemination was the toughest challenge we faced in the vision development at Caritas psychiatric centre. The different groups of users proved to be well interested and capable of raising their voice once there is an appropriate apparatus for critical involvement set in place. More energy was needed to stay true to the desire that was formulated and envisioned in common, i.e. to embed the articulated needs and desires in ongoing processes, adapt it to ruling procedures and enable people to act accordingly. We found three ways for the dissemination of knowledge. In the first place the common vision was articulated in seven or more spatial structure plans articulating the future use of heritage, green spaces, mobility, places for activity, places to rest, etc. The problem of these spatial structure plans is that they are nothing but ideal images without binding power and providing no guarantee of impact on the terrain. In our case for example, soon a conflict arised about the layout of a parking plot in the open field facing the administrative building – a field considered sacrosanct by many as it provided a unique open view from the entrance and restaurant. Spatial planning is a delicate practice of ‘para-architecture’ (De Cauter and Dehaene 2007) as it defines chalk lines for the future and is therefore doomed to remain a paper dream image circulating in the parallel world of decision making. Although being delicate fictions, we experienced that the spatial structure plans do have a massive force. As these plans are ‘bricolages of desire’, to use again the terms of Doina Petrescu (2005), they provide a ‘strong basis for negotiations’ about future spatial developments and building projects. In the end the spatial structure plans are the tangible pieces of a vision and discourse constructed in the gatherings with psychiatrists, management, staff and patients – and that’s why they may well be compromised, but they can never be simply wiped out. Dissemination happened, secondly, through articles presenting the questions, debates, and provisional outcomes as general knowledge to a broader public. 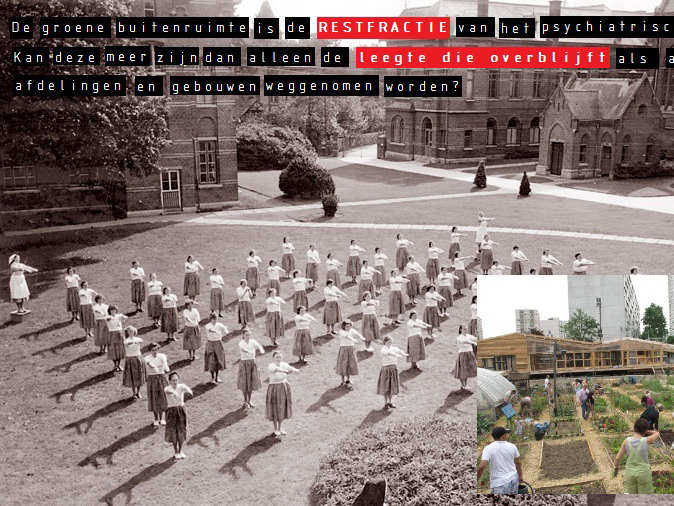 The Psyche magazine was used as platform not only to publish critical case-studies – as we did for years – but now also to construct a series implicitly called ‘Building Stones for the Psychiatric Centre of the Future’. The publications often faced both informal and formal critique from the people working at Caritas. 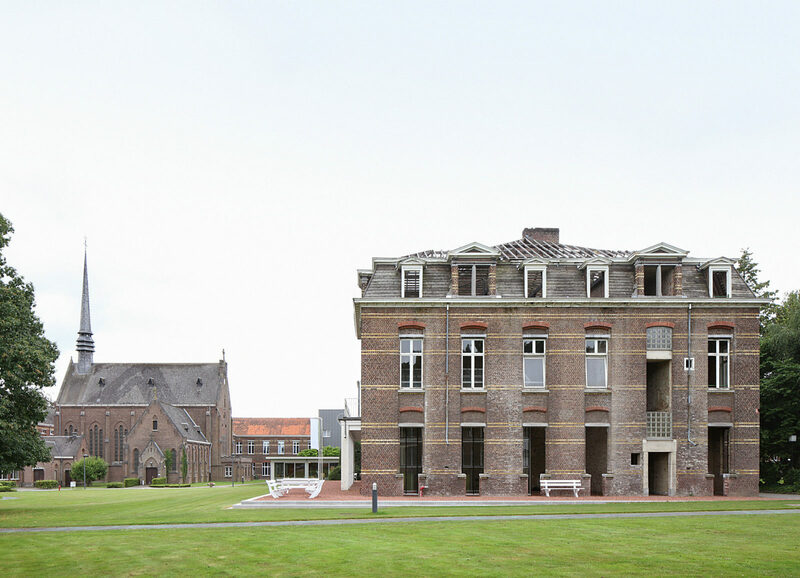 For example, the article discussing the re-use of the heritage as stepping stone for the future – Sint Jozef in particular – provoked questions about the rigidity in which new functions were allocated to specific building (Boie and Vandamme, 2015b). Although the general public was addressed with premature ideas, the articles had nonetheless a considerable effect on the internal process of vision development. The articles were helpful for the actors involved to ‘digest’ the issues and enabled them to cross through the ‘spatial thickness’ of the psychiatric centre, i.e. the thick layer of uses and habits that unwittingly supports the spatial setting as we know it (Doucet, 2015). Finally the project definition for the re-use of the Saint Josef building was a third element of dissemination. Along the way of the workshops, the Saint Josef building started to function as pars pro toto. For almost magical reasons that one building became the central point of reference in the talks. The central position on the campus, the idle function for years and the unfinished demolition certainly had something to with it. Anyway the Saint Josef building enabled every stakeholder to translate their needs and desires about the future in a very tangible way. The vision development for a spatial masterplan suddenly tipped into a highly concrete, localized and urgent action. At the same time bodies of abstract knowledge about care architecture was catapulted into the heart of the organizational management of the psychiatric centre. Once having the idea to re-use that empty building was up in the air a chain of consequences were triggered. The general director called us late in the day leaving the message: ‘Let’s do it! Prepare a note and we will convince the Board of Directors to halt demolition’ – it was in the middle of Christmas Holidays. It took another year to come to terms with practical affairs: re-negotiating the contract with the demolition contractor, re-arranging the allocated budgets, finishing the life-long blanket contract with the architect, scripting a project definition that included as much as possible information from the workgroups, launching an invited tendering process for architects, etc. In short, the reuse of the Saint Josef building functioned as a ‘point de capiton’ on the streams of consciousness and feedback loops circling around and forced all people involved to start dealing with the future now (Zizek, 2002), the catalyzer, the grip, the devise of ignition . The work done at the Caritas psychiatric centre has been, throughout the whole process, a collaborative effort with Fie Vandamme (BAVO). Boie G., Vandamme F.: 2015a, De toekomst is aan het zorgerfgoed, in: Psyche: Tijdschrift van de VVGG, 27 (1), pp. 20-21. Boie G., Vandamme F.: 2015b, Wat gebeurt er tussen paviljoen en schietveld?, in Psyche: Tijdschrift van de VVGG, 27 (2), pp. 20-21. De Cauter, L., Dehaene, M. : 2007, Meditations on razor wire. A plea for para-architecture, in: V. Patteeuw a.o. (eds.) Visionary Power. 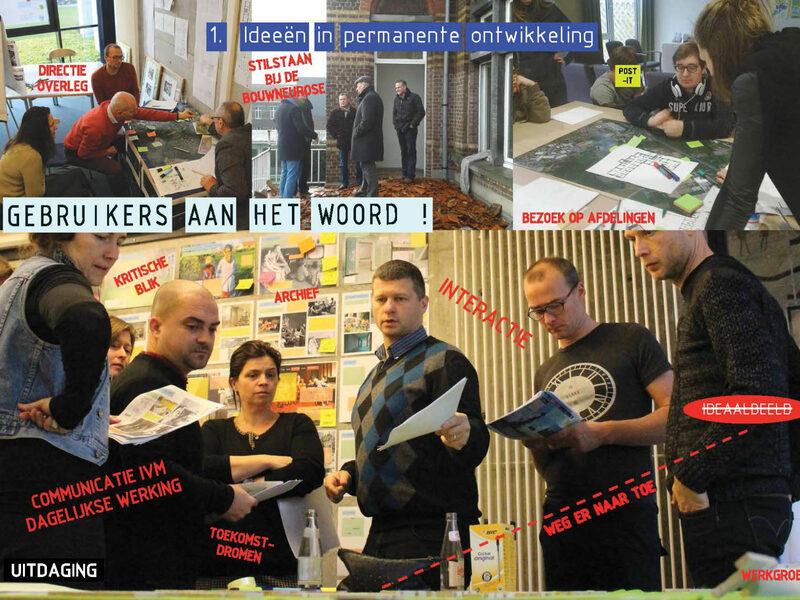 Producing the Contemporary City, NAi-publishers, Rotterdam, pp. 233-247. Fior, L.: 2014, The Art of Public Action, lecture in the framework of ‘Common Grounds’ organized by the KU Leuven Faculty of Architecture, Brussels (February 17, 2014). Harvey, D. : 2004, Space as a keyword, in: N. Castree, D. Gregory (eds. ): 2008, David Harvey: A Critical Reader, Blackwell Publishing, Oxford. 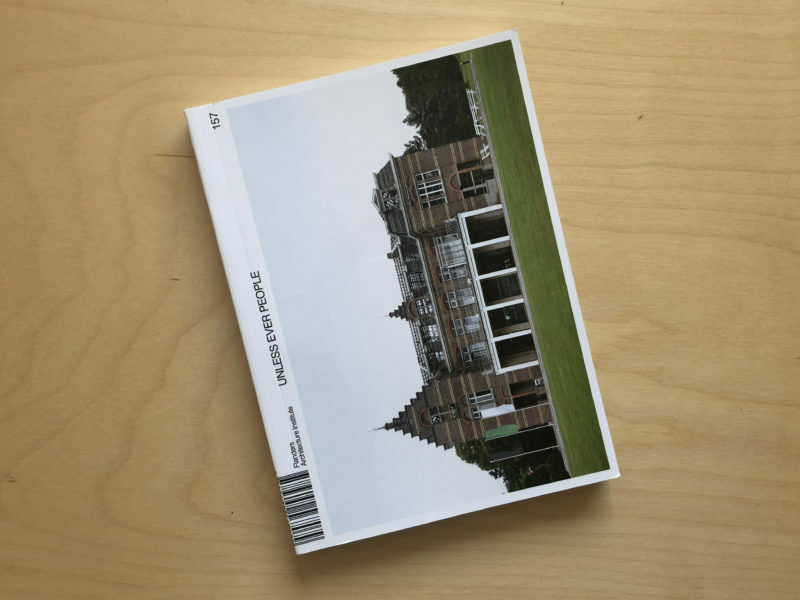 Jencks, C.: 2012, Can Architecture Affect Your Health?, ArtEZ Press, Arnhem, pp. 12-14. Oosterling, H.: 2013, Eco3 doendenken: Rotterdam vakmanstad / skillcity 2010 – 2012, Jap Sam Publishers, Heijningen, pp. 69-71. Petrescu, D.: 2005, Losing control, keeping desire, in: J. Till a.o. (eds.) Architecture and Participation, Spon Press Taylor & Francis, Londen, pp. 43-65. Roose, H.: 2016, Architectuur en zorg samen op zoek naar humane isolatie, in: Zorgwijzer 2016 (59), Uitgave Zorgnet-Icuro, Brussels, pp. 23-25. 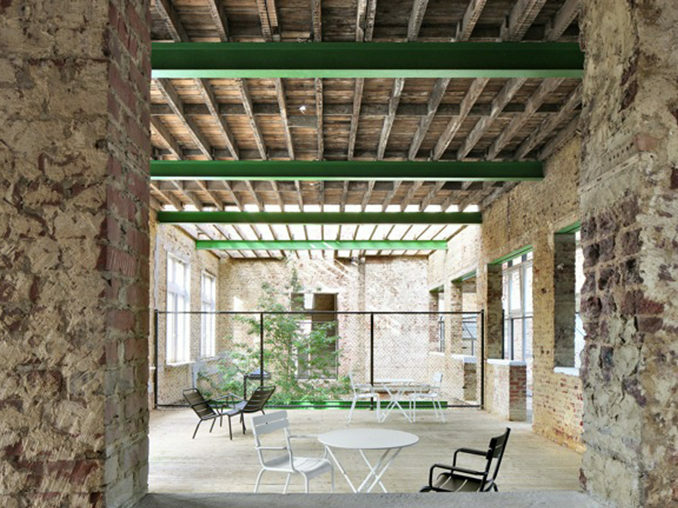 Smets, M.: 2006, Pleidooi voor een dienstbare architectuur: Beleidsnota Vlaams bouwmeester 2005-2010, Ministerie van de Vlaamse Gemeenschap, Brussels. Speaks, M.: 2010, Design Intelligence, in: A.K. Sykes (ed. ), Constructing a new agenda, Princeton Architectural Press, New York, pp. 204-215. Vandamme, F.: 2014, Fit In, Stand Out: Een actieonderzoek naar architectuur als antwoord op mortificatie en recidivisme in de gevangenis, master thesis defended at the KU Leuven Faculty of Architecture, Brussels. Verhaeghe, P.: 2017, Introduction to co-productive architecture, lecture in the course ‘Architecture and Activism’, KU Leuven Faculty of Architecture, Brussels (May 12, 2017).